The parts in the categories below are designed to fit the four (4) cylinder single overhead cam Honda 498cc and 544cc family of motorcycles. These are considered the “mid sized” fours produced by Honda from 1971 to 1977. There are a few variants in this family of bikes, starting with the CB500K (K0 - K2 variations from 1971-1973). Later the engine was increased in size to make the CB550K (K0 - K2 from 1974-1976) and its sportier variant, the CB550F Super Sport (1975-1977). The final variant of the family is the CB550K3 / K4 (1977-1978). 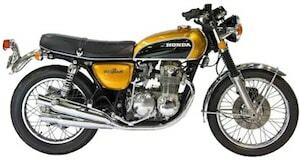 Our Honda CB500K / CB550 FAQ answers many commonly asked questions about these bike models.